According to one poll, over 80% of American drivers have heard of the term BAC or blood alcohol content, but only 27% of drivers can correctly identify the legal BAC limit for their state. A first-time drunk-driving offender has already driven drunk more than 80 times before being arrested. According to one study, using a cell phone while driving can be just as dangerous as driving while intoxicated, causing drivers to miss traffic signals and react more slowly to driving conditions. Frighteningly, the NHTSA estimates that more than 100 million U.S. drivers use their cell phone while driving and about 8% of drivers on the roadway at any given daylight moment are either conversing or texting on their cell phone. According to the law in all 50 U.S. states, a driver is considered to be legally drunk when his or her blood alcohol content (BAC) level is at or above .08 grams per deciliter (g/dL). All 50 states and the District of Columbia currently have “zero tolerance” laws, which make it illegal for anyone under the age of 21 to drive with a BAC of .02 g/dL or higher. An alcohol-related collision is more than twice as likely to occur on the weekend than during the week. Roughly 31% of drivers involved in fatal crashes on the weekend are legally drunk, as opposed to just 15% during the week. Approximately 75% of fatal crashes occurring between midnight and 3 a.m. involve alcohol. Because alcohol dilutes itself in the water volume of the body in order to travel through it, vital organs that contain a lot of water (such as the brain) are particularly vulnerable to the effects of alcohol. Beer is the most common type of alcoholic beverage involved in both DUI arrests and fatal crashes, according to the National Highway Traffic Safety Administration (NHSTA). It is also the drink of choice in most cases of binge drinking and underage drinking. Drivers are far more likely to be alcohol impaired during the night than during the day. In 2007, 36% of drivers involved in nighttime fatal crashes were legally drunk versus just 9% during daytime collisions. Drunk driving causes approximately one-third of all traffic fatalities in the United States. During the year 2007, alcohol-impaired driving was involved in the deaths of nearly 13,000 Americans. Even at BAC levels as low as .02 g/dL, alcohol can affect a person’s response time and driving ability. The probability of a crash increases significantly after .05 BAC, and even more rapidly after .08 BAC. In 2006, more than 40% of drunk drivers involved in fatal crashes were speeding, compared with just 15% of drivers with no alcohol in their system. In 2006, nearly 20% of all 16- to 20-year-old drivers killed in motor vehicle collisions had a BAC level of .08 g/dL or higher. In 2007, more than half of the drunk drivers involved in fatal crashes had a BAC level of .15 g/dL , nearly twice the legal limit. Drinking and Driving Facts: It takes approximately six hours after drinking for the body to completely eliminate alcohol from its system with a BAC level of .08 g/dL. Laws which set a specific blood alcohol concentration level that is above the legal limit are called “per se” laws and were first implemented in Norway in 1936. Per se is a Latin phrase that means “by itself,” and per se laws state that a BAC level of .08 g/dL or above is the only evidence needed of impairment. Mothers Against Drunk Driving (MADD), one of the most vocal political action groups against alcohol-impaired driving, was formed in 1980 in Irving, Texas, by Candice Lightner. She started the group after her teenage daughter was killed by a drunk driver but later left the organization once she felt its focus had shifted from preventing drunk driving to preventing alcohol consumption in general. Motorcycle drivers are the most likely to be involved in fatal drunk driving accidents, with 27% of such accidents in 2007 involving at least one drunk motorcycle operator. Over 1.4 million drivers were arrested for driving under the influence of alcohol or narcotics in 2007. This number is less than 1% of the 159 million self-reported episodes of drunk driving in that year. State laws commonly use two different acronyms to describe drunken or impaired driving—DWI and DUI. DWI stands for “driving while intoxicated” and typically refers only to alcohol impairment, while DUI stands for “driving under the influence” and can refer to either alcohol or drugs. The deadliest drunk-driving accident in the U.S. occurred in 1988 on Interstate 71 in Kentucky when a drunk driver with a BAC level of .24 g/dL caused a head-on collision with a school bus. The crash and ensuing fire killed 27 people (most of them children) and injured 34 others. To determine if a driver is legally impaired, a police officer will typically administer a breathalyzer test. A breathalyzer is a machine that estimates a driver’s blood alcohol content level by determining the amount of alcohol in his or her lungs. To reach a BAC level of .08 g/dL, a man weighing approximately 170 pounds would need to consume four standard drinks in one hour on an empty stomach. A woman weighing about 140 pounds would need to consume three drinks in one hour. * a Centers for Disease Control and Prevention. 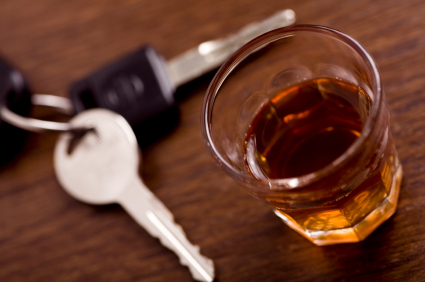 “Motor Vehicle Safety: Impaired Driving.” Accessed: August 3, 2009. * b National Highway Traffic Safety Administration. “Traffic Safety Facts: 2007 Traffic Safety Annual Assessment—Alcohol-Impaired Driving Fatalities.” Accessed: August 10, 2009. * c National Highway Traffic Safety Administration. “Traffic Safety Facts: Alcohol-Impaired Driving.” Accessed: August 12, 2009. * d Strayer, David L., Frank A. Drews, and Dennis J. Crouch. “A Comparison of the Cell Phone Driver and the Drunk Driver.” Accessed: August 12, 2009. * e Van Tuyl, Christine. 2006. Drunk Driving. Chicago, IL: Greenhaven Press.